When you’re in Orlando, most everything falls into the imposing shadow of Disney. Don’t get me wrong, I’m a Disney convert and love what they have to offer families. However, unless you’re a diehard, odds are you might want a warm family getaway in Orlando that can be found outside the confines of Walt Disney World Resort AND is more affordable. 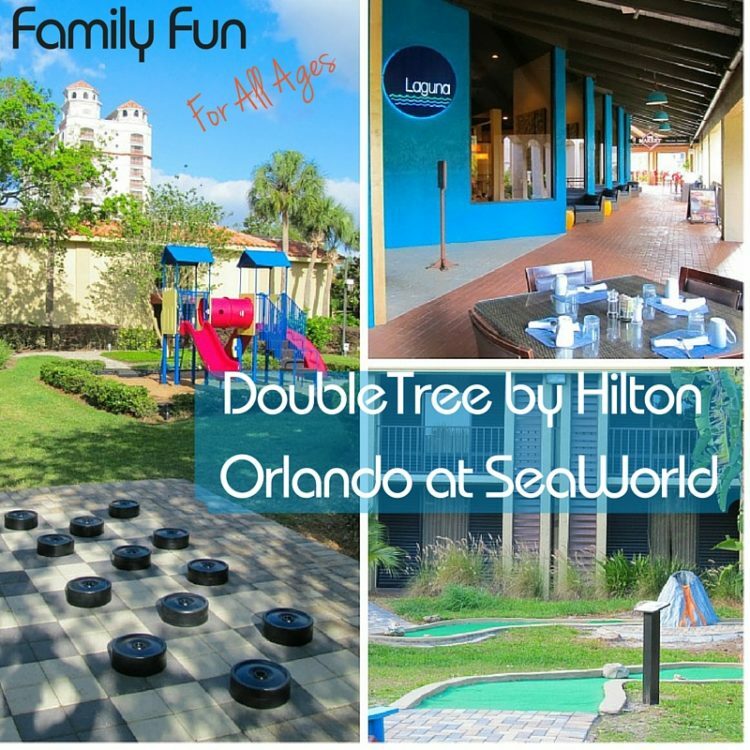 In staying at the DoubleTree by Hilton Orlando at SeaWorld, we found we could dine, play, rest and play some more right on-site. This is the ultimate pairing of location and amenities to satisfy the need for a family-friendly vacation that is both easy on the wallet AND stress-free for all ages. When you want a family-friendly Florida vacation that will please everyone and doesn’t include Disney, Doubletree by Hilton Orlando at SeaWorld is absolutely the property and the experience to choose! SeaWorld, Discovery Cove, and Aquatica are all within walking distance or are close at hand and there is oodles to do on-property without ever leaving! I will admit, figuring out how to actually get to the front entrance and into the DoubleTree by Hilton Orlando at SeaWorld gated property baffled us initially. As you might have guessed we – being rural folks – are always a bit on edge when in traffic–navigation services in the Zipcar helped significantly–but that’s another story! I actually had my husband let me out at the spa entrance and I walked through the hotel to check us in. 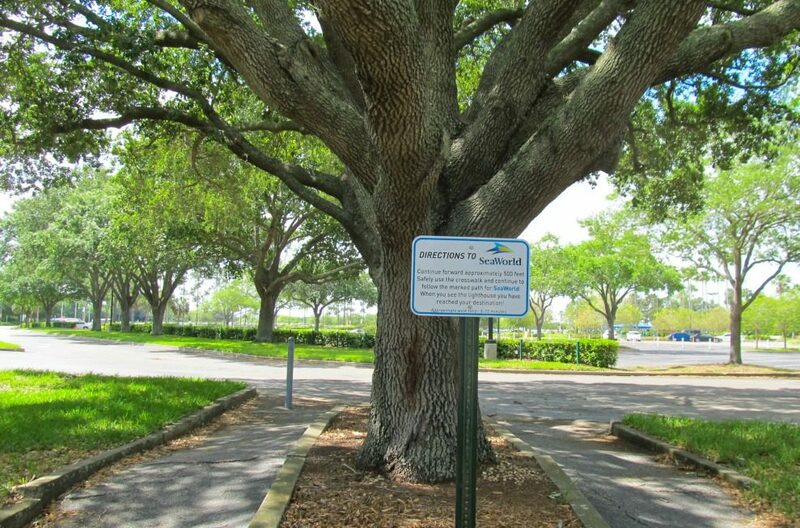 He was able to eventually figure out the International Drive entrance road and get us officially parked on-site. This entry point gave me a great first look at the grounds and as soon as the glass door whispered shut behind me, I felt like I’d been transported out of the city! (Not just because I’d entered the serenity of the spa area either!) The amount of green space available to families to decompress is astounding considering you are still inside a huge, sprawling city–over 25 acres of space that DoubleTree guests can explore! This space is going to be expanded even further with the addition of a “mall” area for family picnics, a round of frisbee, or a beautiful wedding or outdoor event space. The renderings I was able to take a peek at have me putting the DoubleTree at SeaWorld on our “visit again soon” list. Part of the allure of Florida is definitely the wildlife. Amazingly, we didn’t have to venture to Busch Gardens or Animal Kingdom to find all sorts of creatures. We simply opened our patio door and as mom and dad enjoyed sipping morning coffee, the kids were able to fruitlessly attempt to catch the ever-present anoles that frequented our patio. Though we were on the ground floor and there wasn’t a true “view” to be had, the hedgerow planted parallel to the building offered a private, outdoor space to enjoy the balmy nights and early mornings before venturing further to have fun! After enjoying anole antics, guests can meander the many paths connecting the hotel lodging and activity buildings. The buildings themselves create a bit of a bulwark from the traffic and buzz outside the property, so the lush, tropical oasis within that border is teeming with luxurious means to escape and truly enjoy your stay. Want to lounge in a hammock under the palms? Just pick the spot you like best; plenty of shady spots are available! Three pools, a day spa, and all sorts of options for dining (which means you can relax some more knowing that, rather than mom worrying about what’s for dinner, world class chefs will have a menu full of gourmet options to feast upon. As is the case whenever we find a great destination that we fall in love with — where nothing is a challenge, the whole family is happy, and we are having a blast — time flies by and we’re left wishing we had more of that precious commodity! We absolutely felt this way at the DoubleTree by Hilton Orlando at SeaWorld. There was so much to offer a busy family that we felt our two nights were too short. Stay for a whole week if you can! As laid back and relaxed as we felt, a few more days and we northerners may have found the key to a slower pace down south right here next to SeaWorld. One of my favorite memories for the family album is enjoying some special time with my big boy watching Inside Out on the big screen, while attending a “Dive-In” movie. These fun showings happen every Saturday night. We experienced crazy winds and, halfway through the showing, we were the only people in the pool, BUT it was a fun twist on special movie together time! We then bonded while soaking in the hot tub and completely throwing bedtime out the window! There’s a reason it is called DoubleTree by Hilton Orlando at SeaWorld…proximity to SeaWorld couldn’t be better. Really we just had to walk around the pool area and follow the signage to SeaWorld. After crossing one street that wasn’t too busy we were there! You walk right through the parking area where buses and shuttles pick up and drop off, so you’re saving the parking fee and walking just a few feet more than the poor saps that drove. Plus, you’re getting warmed up for the walking you’ll be doing around the theme park! Tip: Make sure to ask about the quick queue perks that you are entitled to as guests of the official SeaWorld hotel property! You also get access to the SeaWorld Rescue Tour and complimentary transportation to the park (if you are not going to take advantage of the path). In addition to those benefits, you also get early access to the parks on certain dates and 10% off merchandise and 10% off dining with some restrictions (check the DoubleTree by Hilton Orlando at SeaWorld website for the specifics). One of the neat services the hotel offers to guests is their Expedia Local Expert Guest Service Desk (alongside the business center and UPS Store) where you can get the latest information on all the park perks and guest benefits you can take advantage of as a hotel patron before heading into the parks. This is a Disney-sized vacation getaway without having to deal with the stress, crowds, and cost of a Disney stay! 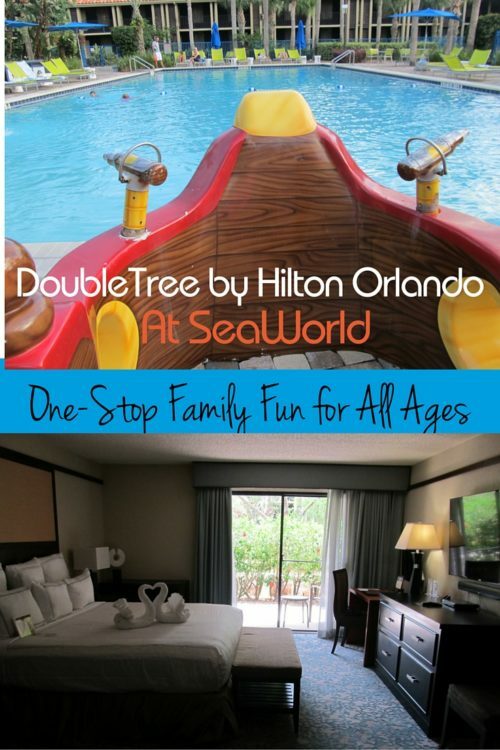 The DoubleTree by Hilton Orlando at SeaWorld is a self-contained paradise in the heart of Orlando with plenty to do right on site but within walking distance of SeaWorld Parks for extending the fun! This is a vacation that will please even the pickiest in the gang! We really enjoyed staying here too. Very convenient!